Miss Daisy was almost 12, and she was getting frail. 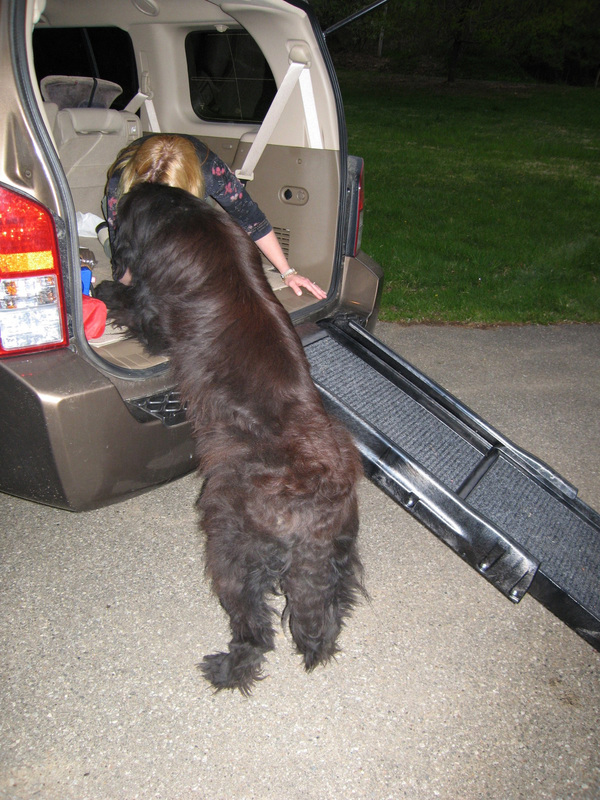 She was no longer able to nimbly leap into our Pathfinder, so we bought her a ramp. 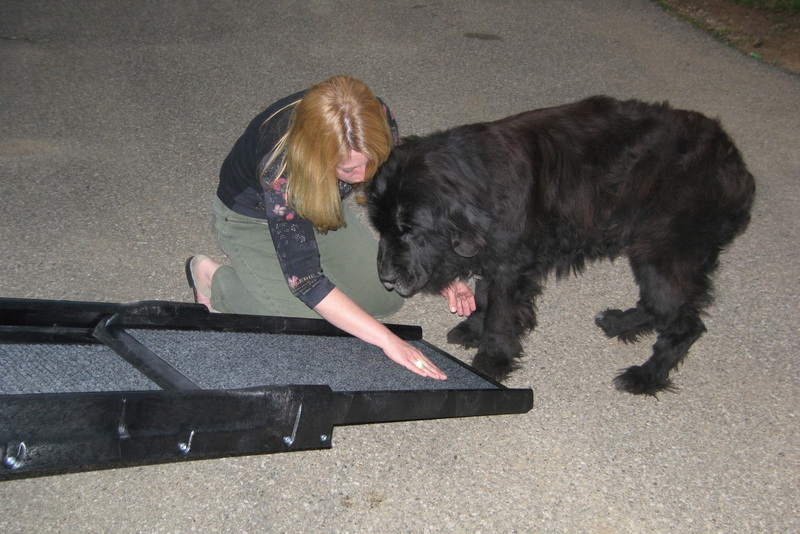 Instead of making one, we shelled out almost $100 for a fancy plastic extending ramp with handles and a nice carpet for traction. These ramps are great for dogs, especially when they learn how to use them at a young age. We weren’t smart enough to have bought one when the dogs were a young age, so now we had the pleasure of trying to teach an old dog a new trick. Daisy had been jumping into the back of the truck since we bought it. Daisy had jumped up onto everything from benches to beds to boulders when we went on hikes which had convinced us that she was part mountain goat. Daisy was still firmly convinced that she should be able to jump anywhere she wanted including couches and the back of the Pathfinder. He aged body simply didn’t agree. We set the ramp up on the back of the Pathfinder and let Daisy sniff it. She was not impressed. 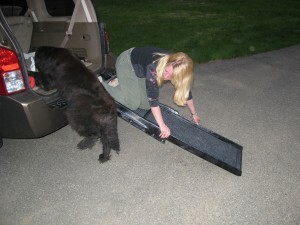 She was, however, quite excited that she had been led to the back of the car, since that had always meant a road tip. She looked at the ramp, looked at us, then proceeded to climb onto the tailgate with her front paws. Unable to get her hind legs up, she stood there for a while looking at us as if to say Well? Lift me up! We gently put her back on the ground, and thinking we were clever, put a trail of cookies on the ramp. Surely Daisy would follow the trail of treats, what with her being a dog and all. She ignored the cookies and walked back over to the tailgate where she tried to climb in again. We gently lifted her front paws back to the ground once more. She snorted her displeasure at not being obeyed. Where did she learn that bit of snark, we wondered? Lauren, having been a psychology major in college, decided that Daisy needed a different method of instruction. We led Daisy back to the base of the ramp, and while she watched, Lauren crawled up the ramp on her hands and knees. The kids especially enjoyed this. I however found no enjoyment at all in watching my wife crawl on her hands and knees up the ramp. It wasn’t humorous at all and I stand by my recorded statement to that effect. While Lauren crawled up the ramp, Daisy watched with bored indifference. When Lauren got to the top of the ramp and entered the truck, Daisy got up, walked around the ramp and crawled up with her front paws again. Now she was face to face with Lauren, who was on all fours in the back of the truck. We all giggled while Daisy wagged. This clearly wasn’t working. Lauren crawled back down the ramp while Daisy watched with two paws on the truck and two on the ground. When Lauren got back to driveway level, Daisy jumped lightly off of the truck and sat down with a snort (seriously, she never snorted when Cozy was around!) She was irritated that Lauren was playing games with her. I could almost hear her saying, Stop fooling around and lets go! We tried in vain for almost an hour. The best we could achieve was two paws. I couldn’t be sure, but I got the impression the Duchess considered the entire affair to be beneath her and after she managed to convey this to us, the $100 ramp was relegated to the garage. Daisy was no doubt convinced that we had all lost our minds. Why would we bring her to the back of the truck, open the door and beg her to come in, only to throw cookies around, climb in and out of the truck like idiots, close all the doors and go back inside? Daisy snorted once more to make sure we understood her displeasure, then walked back inside for a drink of bottled water.